Wish everyone good healthy and prosperity ! 17th Feb was Oppa’s birthday. Koreans eat seaweed soup on their birthdays. 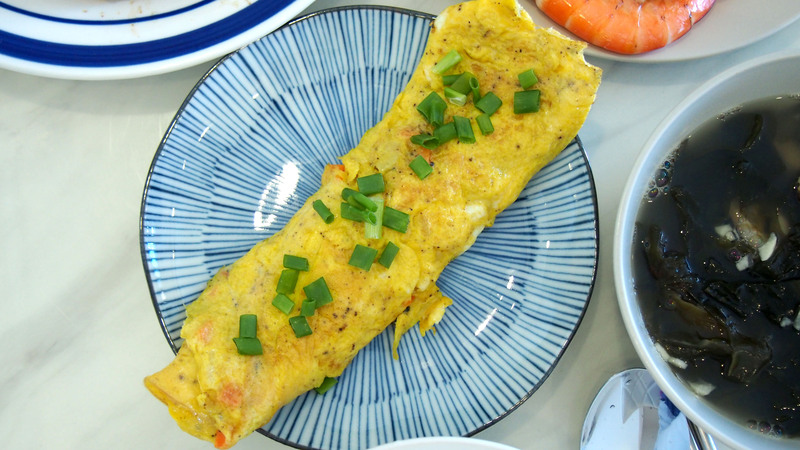 Just like how Chinese have mee-sua with eggs on their birthday. When pregnant and after child birth , mothers drink seaweed soup to replenish nutrients , bloody supply and relieve labour pain and discomfort. So they drink seaweed soup on their birthdays to remember the pain and hardwork their mothers went through. 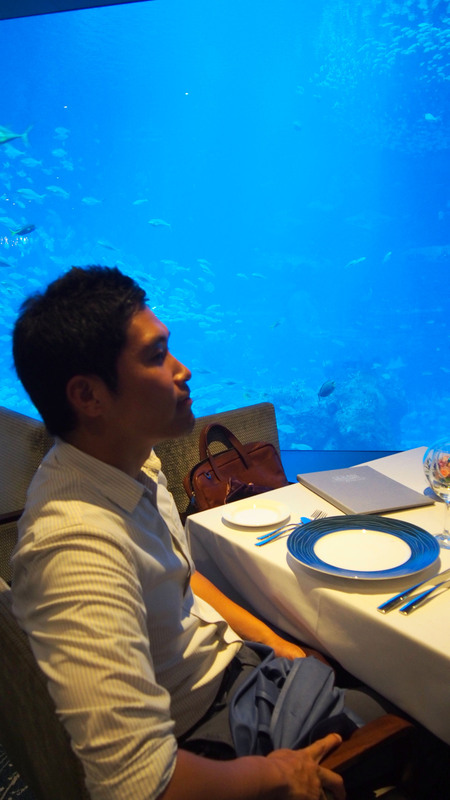 Spending his birthday away from home and no one to cook him birthday meals and seaweed soup. So on tuesday , i woke up early at 9am to prepare his lunch. Oppa’s office is just 1 bus stop away so he can come back for lunch. Because there are only 1 frying pan and 1 pot and only 1 workable stove , i have to cook one dish at a time. LOL that’s why i have to start at 9am and took me 3 hours to prepare. I used my mobile phone to take the pictures because my hands were dirty from all the marination , chopping of onions and garlics etc. So i can’t take pictures of every single ingredients i used. 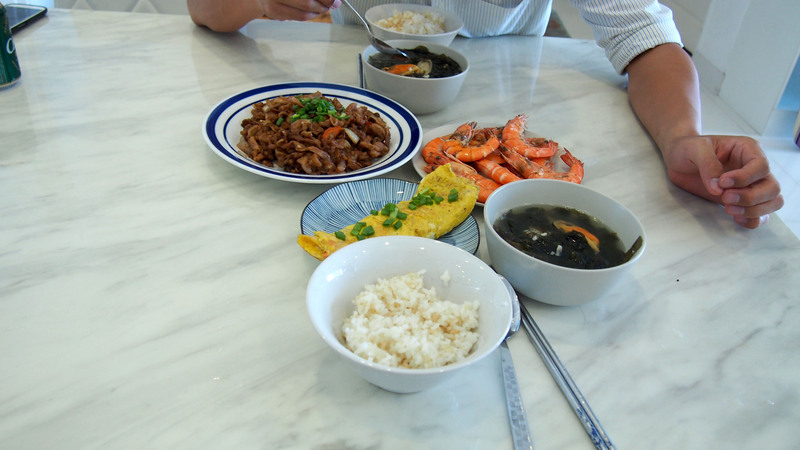 I cooked seaweed soup , his favourite omelette (korean style) , prawns and bulgogi. I didn’t have time to do proper Korean style marination the day before so i did it within 2 hours early in the morning when i woke up . Traditionally you have to marinate the night before and leave it in the fridge for at least 6-8 hours before you cook it. I did a short cut and marinate it for like 2 hours only with black pepper , Korean soya sauce , sesame oil and Korean seasalt seasoning with herbs. It turned out so nice that he had everything and i only had a few slices. 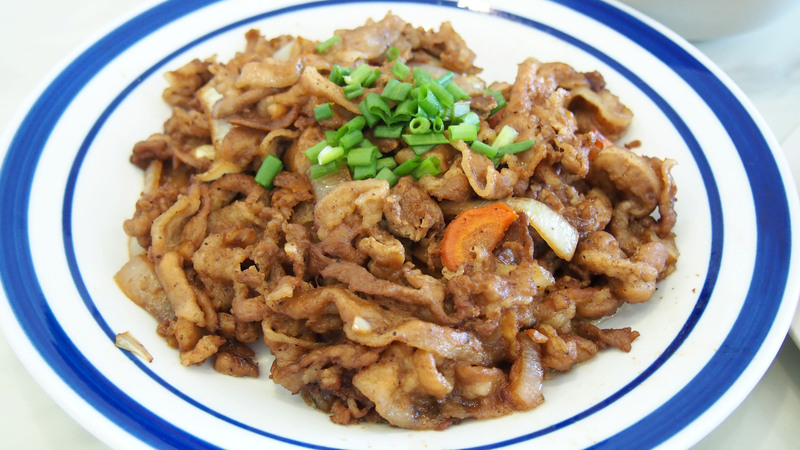 I just throw some minced garlic in the frying pan , onions , carrots and the marinated meat into the pan and fry. That’s all. super easy. Garnish with spring onions after that. Korean seaweed soup. Very easy to cook ! I replaced beef with mussels instead. Mussels are believed to be good for skin and health. I used beef the other time but it kinda changed the colour of the soup. So i used mussels this time. So here’s how to make the seaweed soup. You can buy the seaweeds from Korean supermarkets (Shine Mart, Lotte Mart, Sol Mart , Seoul Mart). Look for the ones that are used to cook soups ! It comes in a sealed pack. Oppa’s mother sent me alot of good quality and expensive seaweeds from Busan. So this may look different from the ones you buy at Korean marts which may not be as smooth. If you want good quality ones , you can buy from Korea. 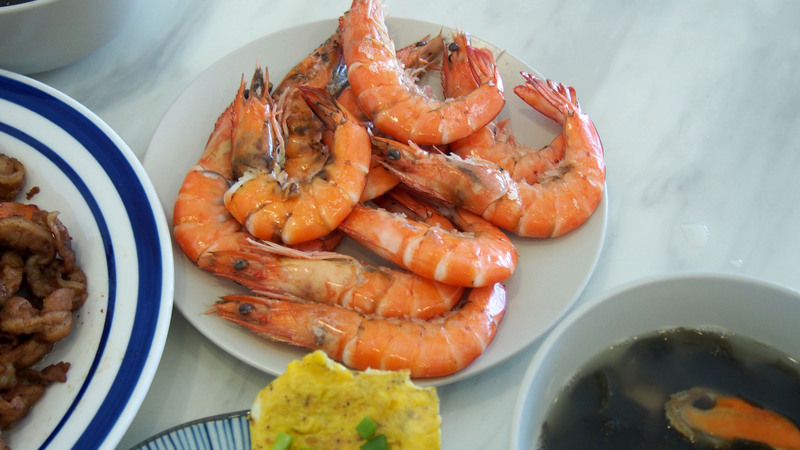 This is different from the Chinese seaweeds you eat in yong tau foo. So don’t mix them up. I got a pack of large mussels from Giant supermarket. About $4.84 for 8pcs ( comes with shell) , i washed the mussels and removed the shells because the shells are dirty. Chopped garlics ( about 3 cloves ). 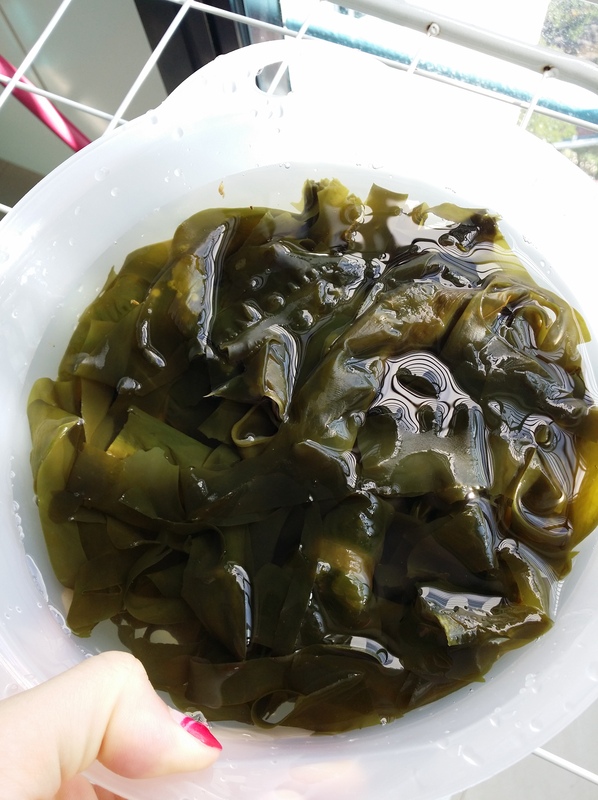 Soak the seaweed in a pail of water. This part you really have to be careful. The dried seaweed portion you see above ( scroll up for picture of the pre-soaked dried seaweed. ) is for 4 pax ( 4 -6 bowls ) . The dried seaweed expanded after soaking in the water for 10 minutes. The entire pack you buy from Korean supermarkets can feed up to 10 bowls. So take bit by bit to soak to get the amount you want to serve. Take abit to soak first and if it is not enough, then take a bit more to soak. 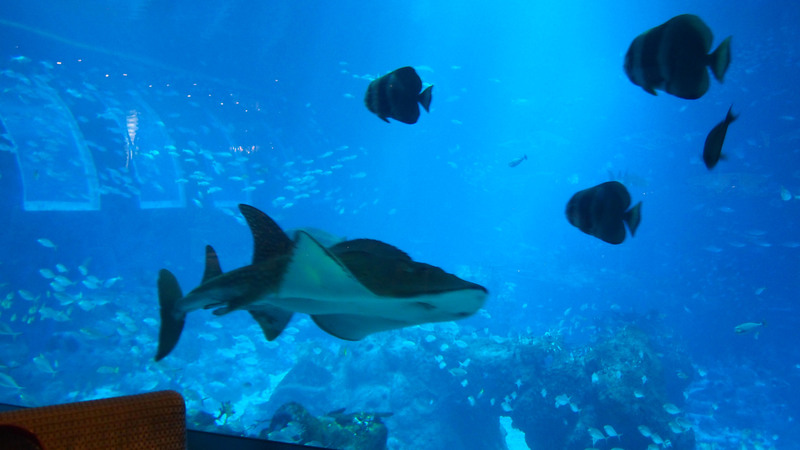 If not you will be shocked by the amount of seaweed and wasted your money if you throw the excess away. 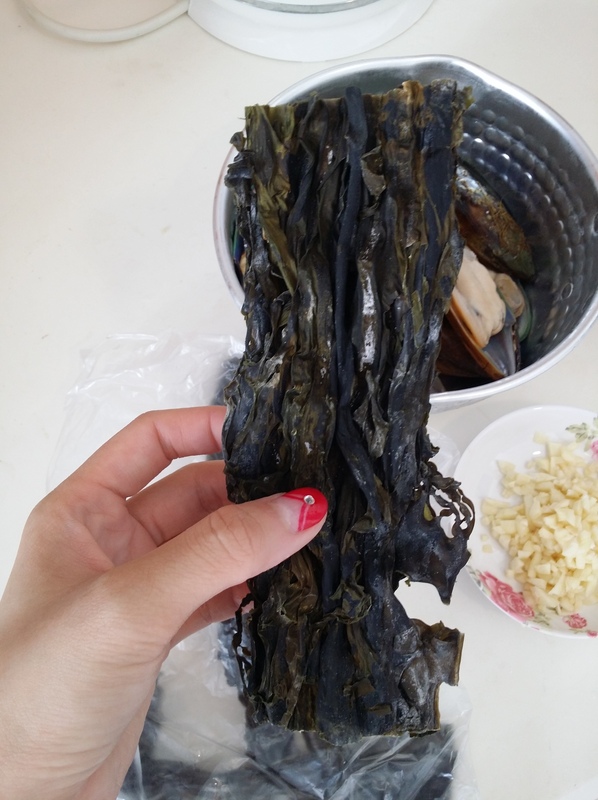 After soaking the seaweed for about 15-20 minutes , sieve it out and throw away the water. Then marinate the seaweed with 2 tablespoon of sesame oil. Don’t add too much. Try to adjust according to the amount of seaweed you have. Because you don’t want your soup ended up looking too oily because of the sesame oil.. Boil a pot of water and throw in some large anchovies and cut sea tangle. Remember to use large anchovies ! Not the small ikan billis size ones. 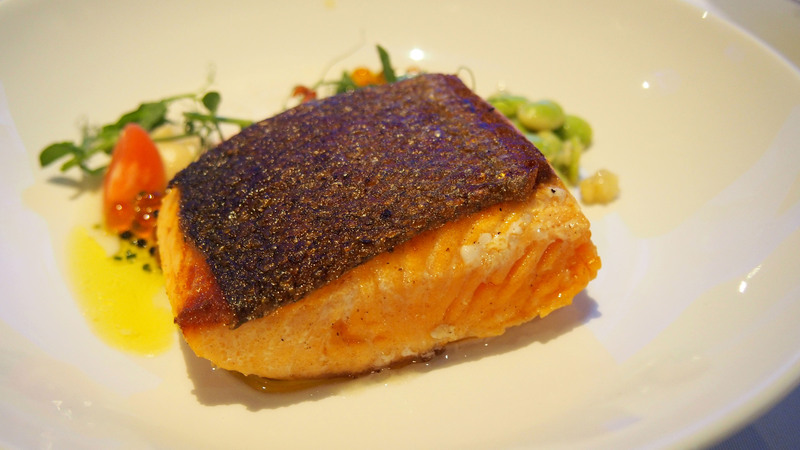 The anchovies and sea tangle are like seasoning and natural stockings. I don’t like to add chicken stocks , fish stocks , beef stocks or MSG when i cook. So i will use ingredients such as adding anchovies and sea tangle into the boiling water to create my own healthy natural soup stockings. Koreans use large anchovies and sea tangles as soup stockings when they make kimchi soups , ramen etc. I added about 10 large anchovies and 3 or 4 sea tangles. Let the large anchovies and sea tangles boil for about 15 minutes in the boiling water. You can smell the natural soup stocking fragrance after that. 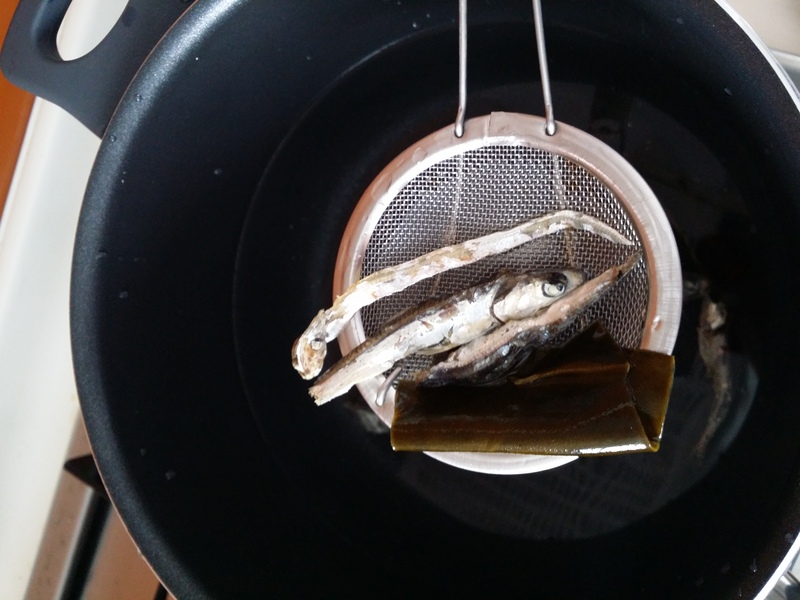 After 15 minute , sieve out the large anchovies and sea tangles . Throw them away. 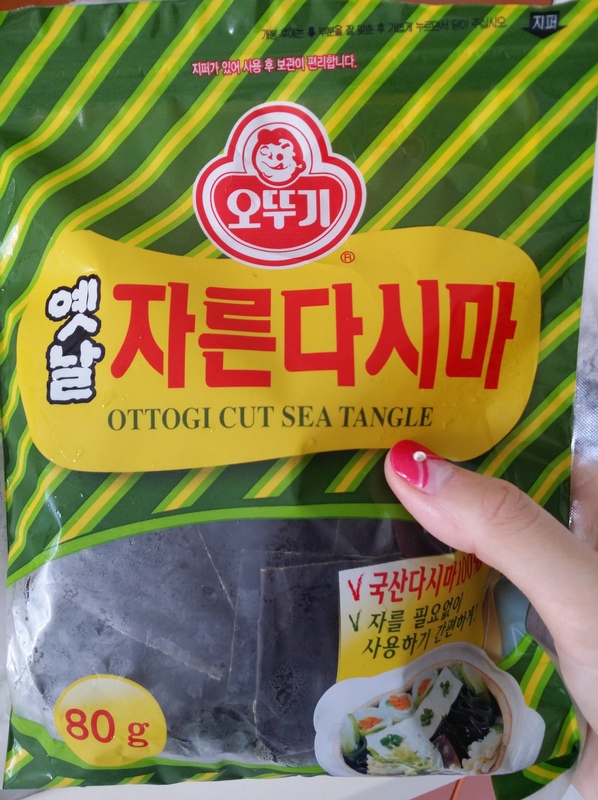 You can buy sea tangles from Shine mart , Lotte mart , Sol mart or Seoul Mart. After that , throw in the sesame oil marinated seaweeds , chopped garlics and mussels into the boiling water to boil for 10 minutes at high heat before switching it to medium heat. Adjust the taste with soup soya sauce ( gook gan-jang ). A kind of Korean soya sauce used for soups only. Instead of adding salt , you can add this soya sauce for soups ). 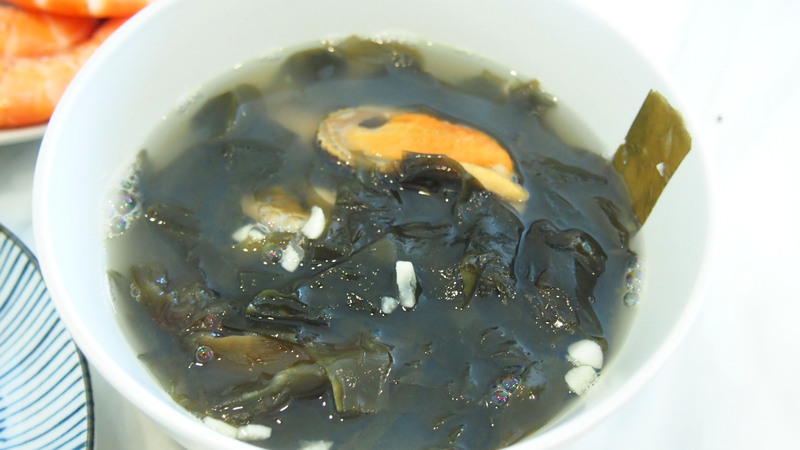 Your seaweed soup is ready to serve ! 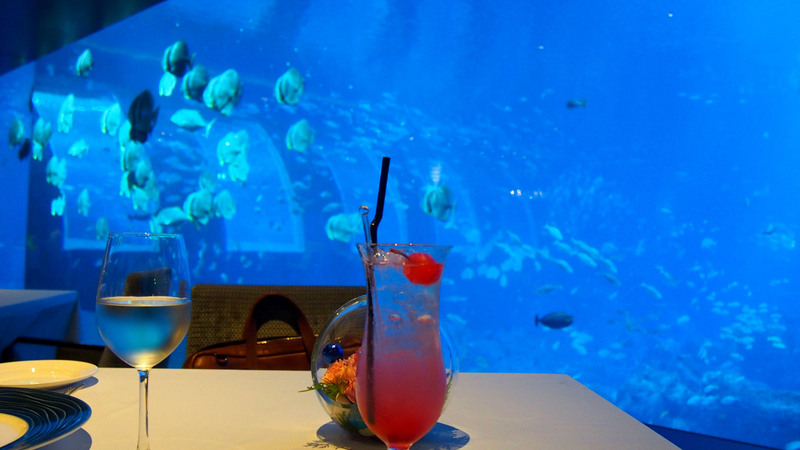 In the evening , we went to Ocean restaurant for dinner. 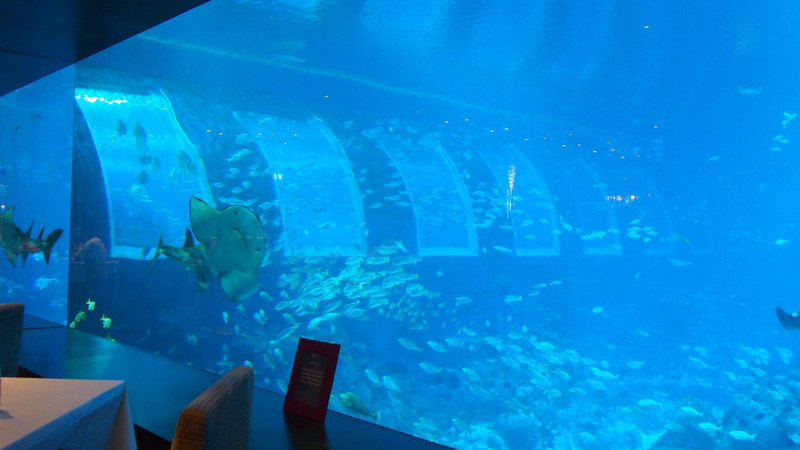 We managed to secure a seat by the tank and it was nice. 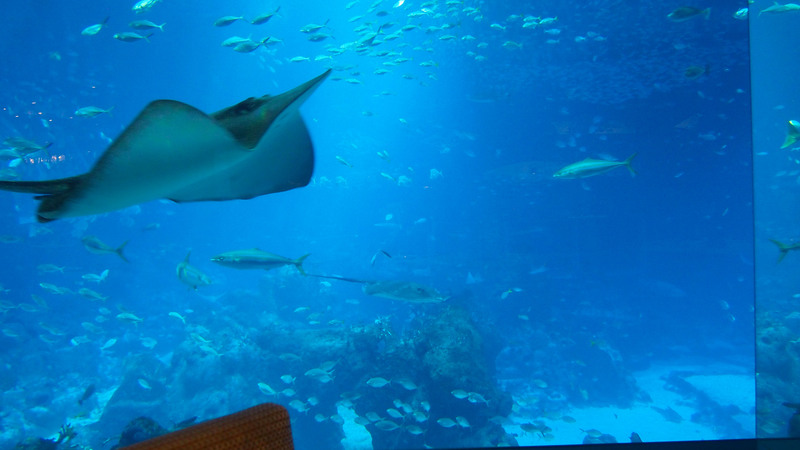 Except that there were alot of children and they were around our table jumping around , screaming etc because our tables are near the tank. I have no problems with kids and i love kids and understand their excitement but the problem is with their parents. 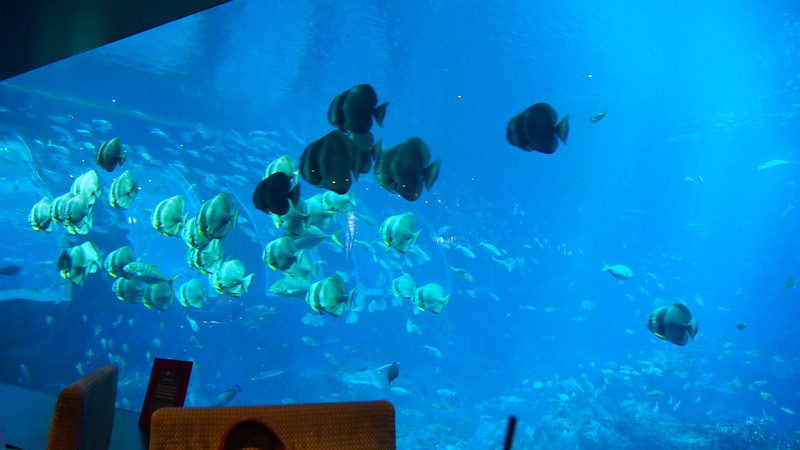 They don’t seem to care that their children are running around other patrons’ tables and screaming everywhere. They never do anything about it. They saw but they don’t care. 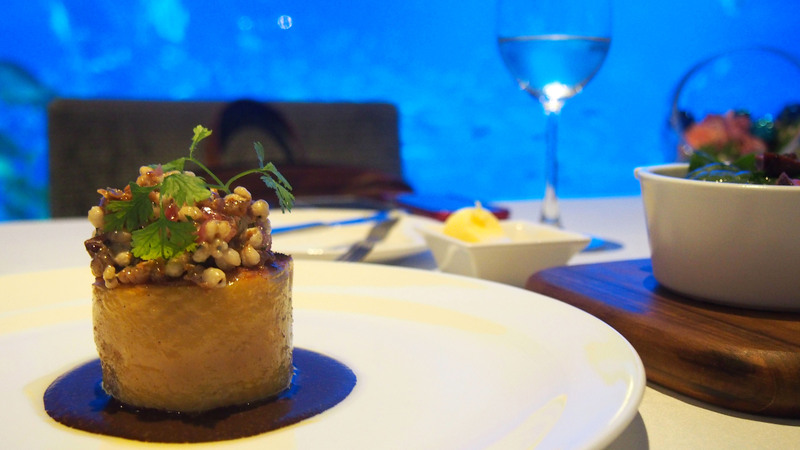 To be honest , the food at Ocean restaurant at RWS was not fantastic and not worth it at all. 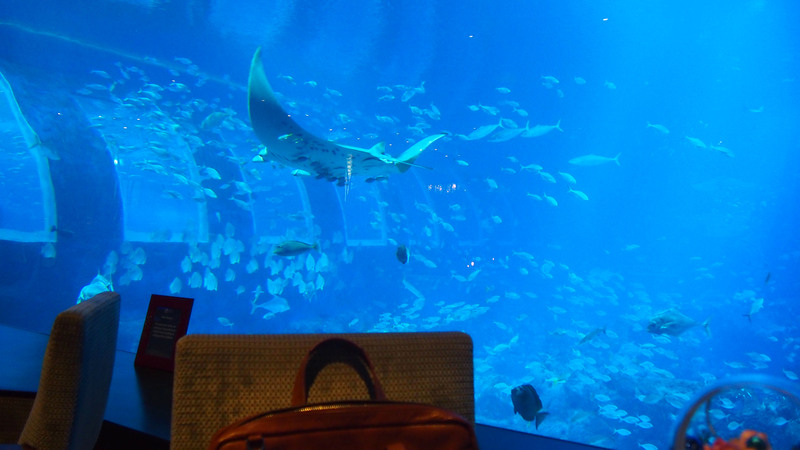 The only thing that compensated was the view if not i won’t recommend anyone to go. I was very disappointed. We paid about $238 for the meal and expected better. The only dish that was nice were the raw oysters. After dinner , we went back home to cut the “cake”. I ordered customized cupcakes from The Frosted Chick. It was very hard to get customized cupcakes. I called Flour Fancies at first and the lady told me to email her what i want and i did not hear from her thereafter. And others never get back to me. Vanessa from The Frosted Chick was really friendly and i love her works. Looks soo nice and we couldn’t bear to eat it ! 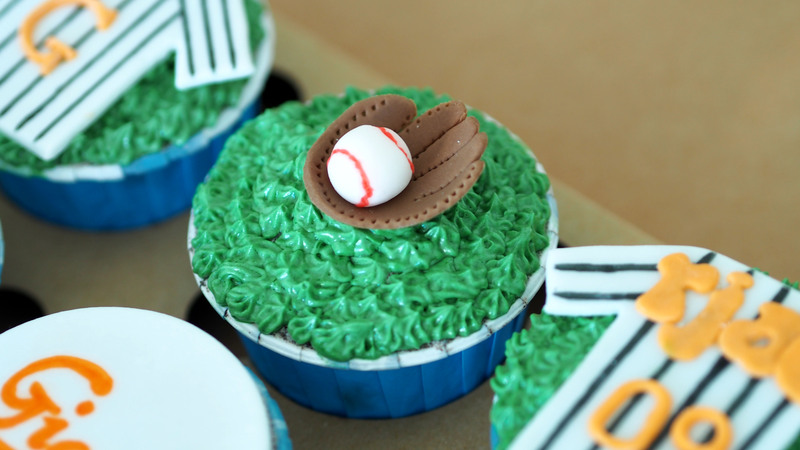 I decided on a base ball team cupcakes because he is a baseball player. Born and raised in Busan , South Korea , he is a huge fan of his home team Lotte Giants. 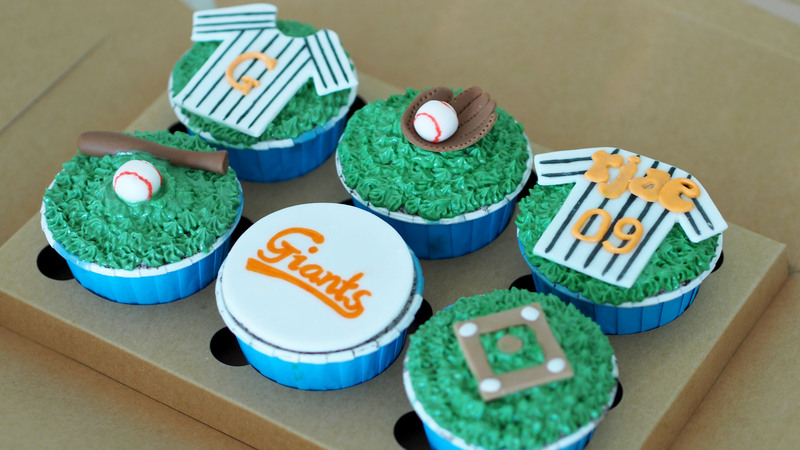 So i decided to go for a Lotte Giants theme cupcake ! So nicee ! Well , it was a tiring Tuesday. Woke up early to cook , rush my work before Agneselle.com’s CNY break and then to a birthday dinner. After CNY , i have to prepare for next launch ! This shirt is coming up in 2 pastel colours and in white too ! Do look out for the next K-beauty post this weekend ! The theme is Sleeping Beauty. Guess what i wanna blog about ?? 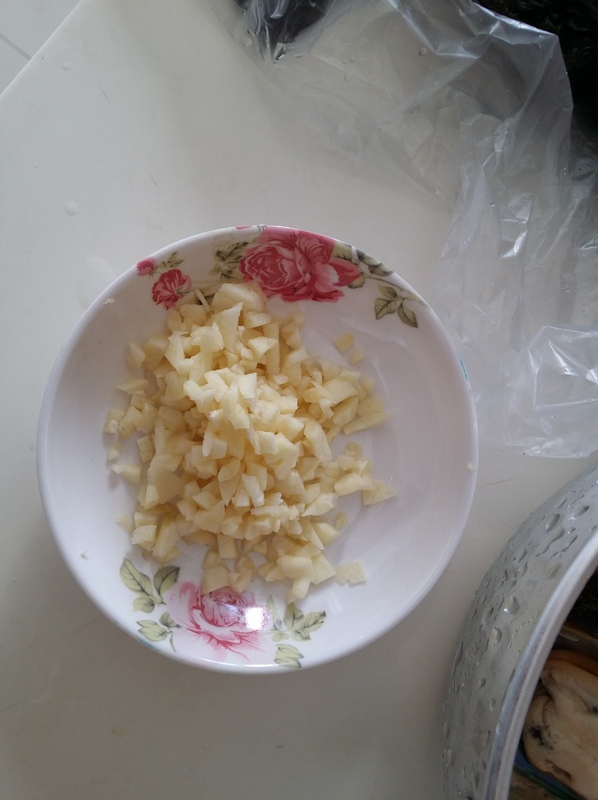 This entry was posted in Korean Food Recipe. This one very hard to find. But i found it at Lotte Supermart at Lorong Kilat which is at bukit timah. I tried chinese ones before but too salty. You can call to the korean marts to ask before you go down.